May | 2008 | Ipoh Mali Talak Sombong! Try to read the title in 3 seconds. 24th May was the official date when Ipoh Mali A (yours truly) met Ipoh Mali C in Ipoh. (who is B you ask? Citygal, of course!). J2Kfm was kind enough to pick me from my house (he stays very near to my house in Ipoh actually) but both of us were clueless where to go for lunch. 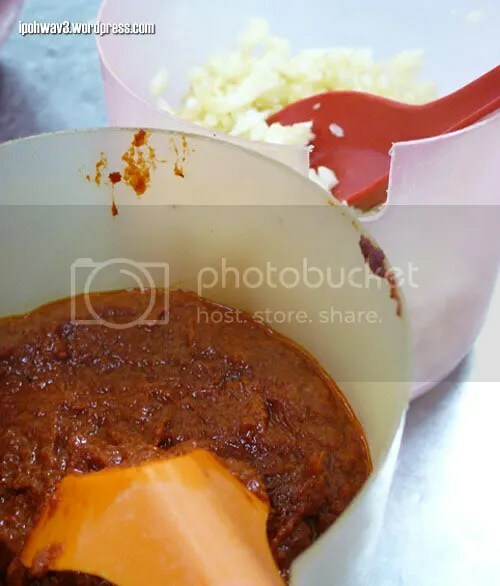 I understand his excitement as the same situation happened to me before when I just start food blogging and I realised there’s no other flogger around in Ipoh. He mentioned about Left Shore which I agreed. It’s time to revisit by the way. It was closed, unfortunately. WTH, closed on Saturdays?? 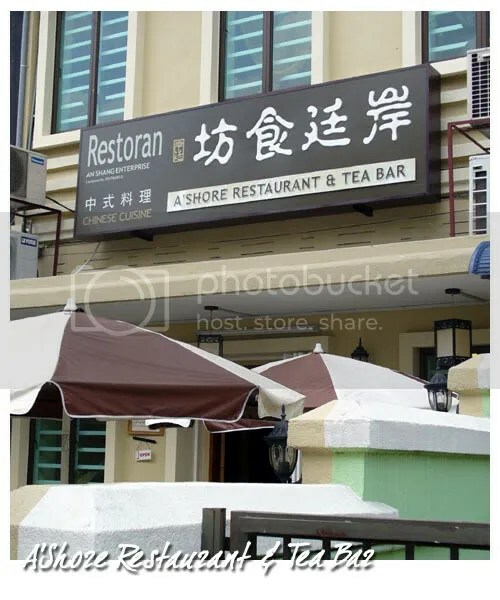 So, we settled with the new place called A’Shore Restaurant nearby Left Shore (similar name…hmmm). Apparently, we’re the only customers at that time (it was around 2pm if I’m not mistaken). Colonial decor, wooden furnitures, chandeliers. The menu was pretty easy to navigate with pictures provided. J2Kfm ordered the A’Shore Spicy Noodle, RM 6.50 which is basically noodles (looks very similar like la mian) in spicy minced meat (both of us decided it was pork), scallions, bird eye’s chillies and some fermented bean sauce and plenty of shredded lettuce leaves, in a BIG portion. He seems enjoyed the noodle except the spiciness which is a bit overwhelming for him. When I see this, I know I had to order it. 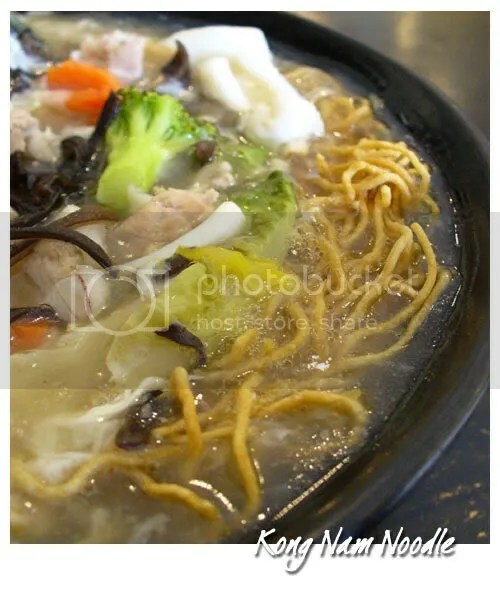 My Kong Nam Meen, RM 6.90 (very similar like kuey teow in egg gravy except that this is yee mee) came in a big portion too and loaded with squids, prawns, tender pork slices, cabbage, romaine lettuce, mushrooms, carrot, broccoli, wood ear fungus and deep fried egg noodles, all swimming happily in the egg gravy. I remember Babe KL mentioned about this dish before and I was hoping to try it one day ever since. The noodle was quite good, but a little more salt added would be better. More customers started to flood the place while we were busy tucking away in our food. I think their price tags were quite reasonable and the ambiance was ok too. They also serve dishes in dai chow style as well but desserts were limited though. We went to Kinta City after lunch as I need to get my latest issue of Flavours and was surprised that they revamped the food court. 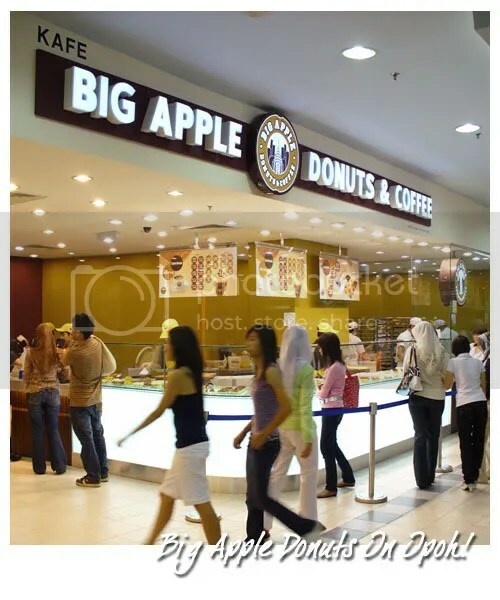 Ipoh finally got it first Big Apple donuts outlet here! Sorry for the long hiatus, been busy with work, catching up with friends and also feeling uninspired to write, hence the lack of updates. But I’m slowly picking up the pace again, so there will be new posts coming up soon. 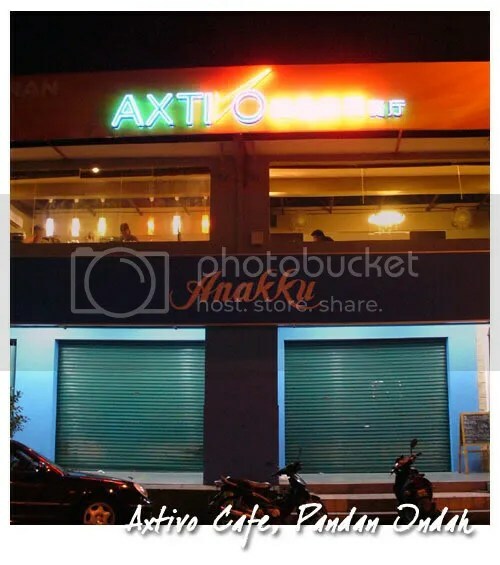 I’ve been trying to explore more of Pandan Indah area lately with Kevin, so here’s our 2nd destination, Axtivo Cafe (a rather weird name for cafe, it sounded more like a brand of a skincare product!) after Tsim Tung (“un-blogged” cos for me, it’s nothing more like another char chan teng out there). Kevin said that this cafe is opened by a Taiwanese or something like that (can’t really remember). 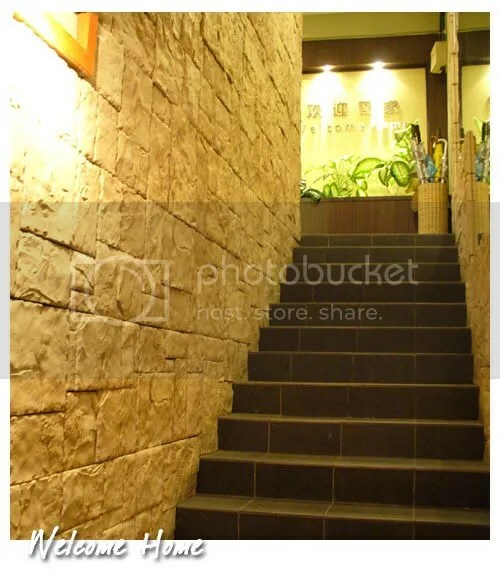 As you step in, you’ll be greeted “Welcome home” in Mandarin by the waiter/waitress, as would the Taiwanese do. Both of us find the interior was rather mismatched; brilliant red sofas with green walls, cement flooring. The furnitures further allowed us to see more of the floor which we think is kinda… not pleasing to the eyes. The crowd are mostly young adults. 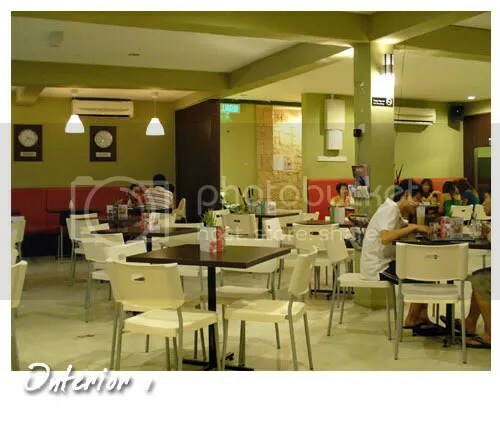 The menu is kinda extensive but most of the item are pretty much similar to the usual char chan teng such as cheese baked rice, fried rice in different style etc. I like the pictures though, very professionally taken. I settled with Italian Fried Spaghetti, RM 7.90 which came with pork slices, cabbage and choy sum in a rather small portion. 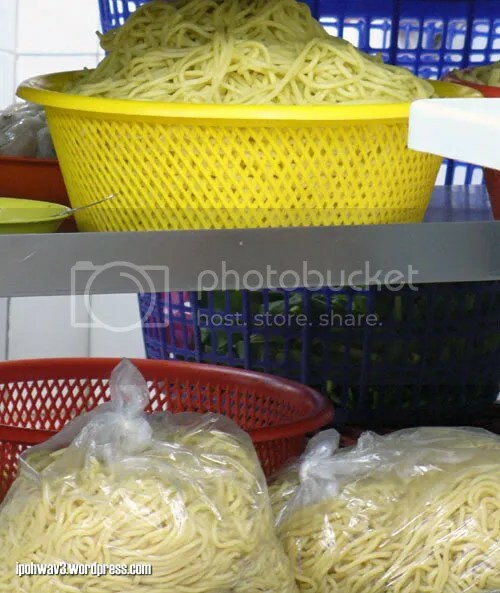 Taste wise, it’s acceptable; not too dry or greasy and the spaghetti was cooked just to the right texture. 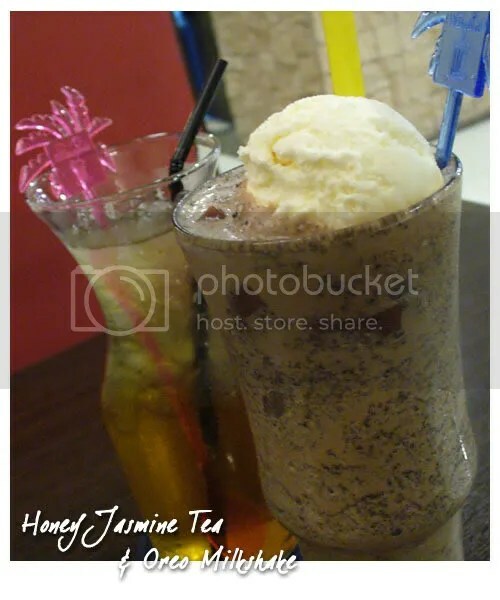 Kevin didn’t had any mains as he ate somewhere else earlier, so he only ordered the Honey Jasmine Tea, big, RM 5.50 while I had Oreo Milkshake, RM 6.90. My milkshake came with a scoop of vanilla ice cream which made the shake creamier but also very filling (people with small appetite might wanna consider to share it). It’s a tad too sweet but it’s nice to nibble on the crushed Oreo bits. Total bill came to RM 20.30 with no service charge or government tax whatsoever. 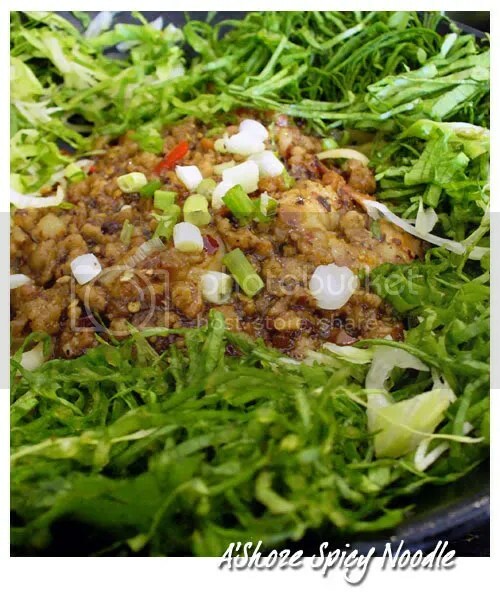 They also have prefixed set lunch and set dinner at a reasonable price, where the items served varies on different days. It’s another good place to sit down for drinks with your friends. Service is quick and quite efficient. I think that I got the “take-a-break-from-blogging” virus lately… Doesn’t feel motivated to type anything. I’m sorry… this will be a short and quick post. Usually when Kevin came to look for me for dinner, I’m always clueless on where and what to have. The other night when he came, suddenly this place popped up in my mind. He’s up for the game as he himself also haven’t try this place before. It was drizzling that night, so all the patrons are forced to sit at the shop corridor and inside the shop. 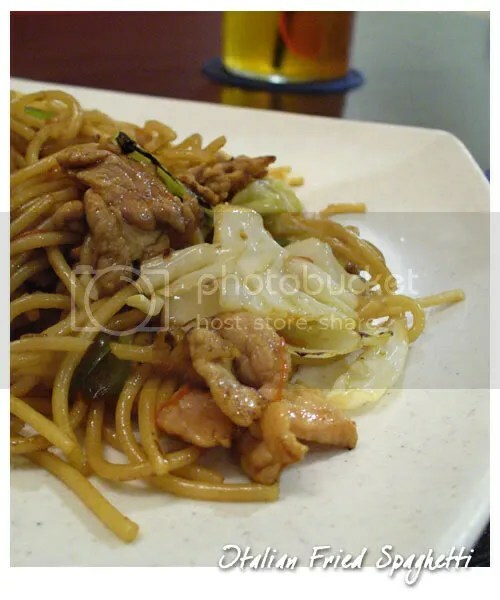 Unaware of what other choices we can opt for, both of us ordered the same fried Hokkien mee (dai look meen. 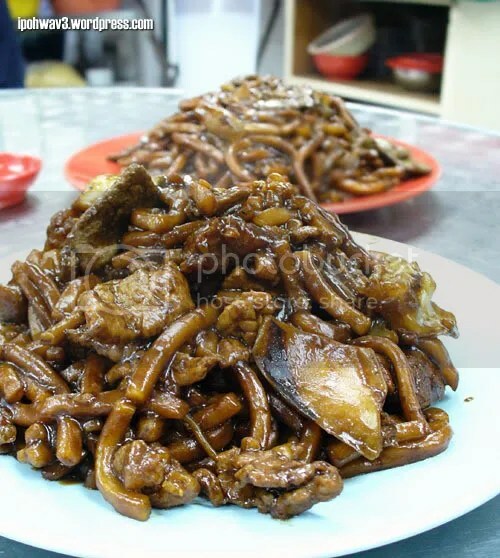 Just to clarify because Penang floggers told me that Hokkien mee is actually Prawn mee… so, this is just to avoid confusion 🙂 ). Only after that, we found out that they also serve some simple dishes like kung pou frogs, kung pou mantis prawns, squid rings etc but since there are only two of us, we dismissed the idea of ordering more food.